There are two things you will get upon purchasing English Mate Classroom. They are movie DVDs and an English Mate token for the school. This token is very important because it is used in the program registration process. 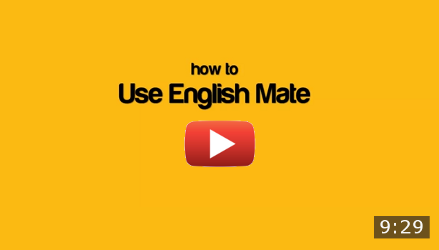 In addition, any computer can use the token to install English Mate until the quota is used up. The numbers of movie DVDs and computer quota are different depending on the package that schools plan to buy. When students use English Mate for the first time, they need to first make an account for the program to record their data. Then, they can choose the movie that they want to watch from their interests and English skill level. While students are watching a movie, there are many features helping them to learn English, and there is a quiz for them to do at the end of each movie chapter. Students need to pass the quiz to proceed to the next chapter. Aside from watching movies up to the amount teachers assigned, they can also increase their accounts’ levels, and compete their scores in a leader board for every movie chapter. Generally, students are given a computer class per week to use English Mate. In the class, students have to watch a movie and do a quiz (movies are separated into chapters so that students can finish one chapter in a class period). The movie that each student will watch depends on their English skills and interests. Furthermore, many teachers have additional activities for students. For example, students have to present about the movies they watched in front of the class or write the list of vocabulary they don’t know in a notebook. To motivate students, we let them watch 2-4 movies each term, and they will be graded in their English class. Teachers can keep track of students’ grades and progresses from LMS via the following website. For more details and examples of managing English Mate Classroom, you can download them here.